Celebrate Elmo's Birthday with Put Me in the Story! We are so excited to have Elmo as part of our family here at Put Me in the Story! For the first time ever, your child can be the star of a personalized book with Elmo. Elmo Loves You!, a bestselling children's book from Sesame Workshop, will captivate your child and have them telling you all the things they love. You can celebrate with us on Sunday, February 3rd for Elmo's birthday. Elmo is turning 3½ and your child is invited to the party with Put Me In The Story! Give them their very own personalized message from Elmo in a book they will treasure all year long. 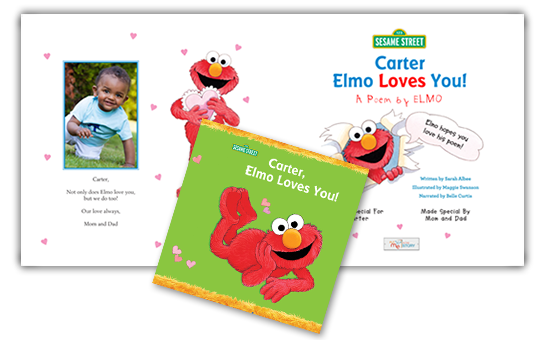 Put your child in the story now with this special sneak peek of Elmo Loves You! Enter promo code LOVE30 at checkout to receive this special offer. This offer expires February 15, 2013.